This adorable Christmas stocking features a princess ballerina teddy bear with a magic wand in one hand and a candy cane in the other. The design also highlights a rag doll having a tea party with a hobby horse, artist palette and peppermint candy. Stitch Count 127w x 201h. Chart only. Christmas Toys II was designed especially for girls as a companion piece to Christmas Toys I which is more appropriate for a boy. 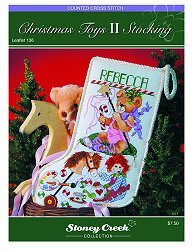 The pattern for Christmas Toys I is available in the August 2004 Stoney Creek magazine (see related products). GlissenGloss 406 gold Rainbow Blending thread (Item #RBT406) is used to stitch this design. 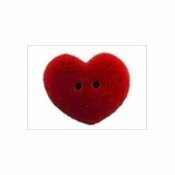 It is embellished with one extra small heart (SB005), one extra small and two extra extra small simple black button (SB027).